This brown coat looks suede, though I believe it is canvas. It has a seam across the chest. It does up with bronze zipper. Brand Information: Unknown. Possibly Carharrt. In Family Matters (6x07), Sam wears it to go to the Campbell compound to check whether Samuel has a soul. He keeps it on for the rest of the episode. In Appointment in Samarra (6x10), Sam puts on this coat to go ‘take a walk’ after Dean tells him about the plan to get his soul back. He takes it off when he and Bobby sit down to play cards and he remains without it for the rest of the episode. In My Heart Will Go On (6x17), Sam wears this coat for the entire episode, except when he is in a suit and when he is inside the motel room. In Defending Your Life (7x04), Sam wears this coat once he takes off his suit. He takes off the coat only while researching the victim’s past in the motel room, when he has to briefly put back on a suit, and after Dean’s trial while they are trying to figure out a way to save Dean. He changes outfits before the final scene by the Impala. In Season 7, Time for a Wedding (7x08), Sam wears this coat at the end of the episode as he signs the annulment and then the boys bid farewell to Garth. In Repo Man (7x15), Sam wears this coat (in the present) upon arrival in Coeur d’Alene. He changes into a suit briefly to investigate the case, but wears this coat again when he and Dean track down Jeffrey in the alley and until the end of the episode. In The Girl with the Dungeons and Dragons Tattoo (7x20), Sam wears this coat for the entire episode, except at the very beginning when he is inside Rufus’ cabin. In Heartache (8x03), Sam wears this coat for the whole episode, except for when he is wearing a suit or inside a motel room. In Hunteri Heroici (8x08), Sam wears this coat whenever he is not in a suit – which means that he wears it for the first scene at the Gas’nSip, and then continuously after the cake explodes at the retirement home. In Everybody Hates Hitler (8x13), Sam wears this coat at the beginning of the episode, when he and Dean first enter the Men of Letters Bunker, and then later when they break into the library at night with Aaron and the golem, and then again much later when they all come back from burning the necromancer Nazis after the final confrontation with them. In Goodbye Stranger (8x17), Sam wears this coat from after they rescue Meg until the end of the episode. In Pac-Man Fever (8x20), Sam wears this coat whenever he is not inside the bunker or wearing a suit. In Sacrifice (8x23), Sam wears this coat whenever he is outside. He takes it off inside the church when he begins the third trial. In I Think I’m Gonna Like It Here (9x01), Sam is wearing the coat again at the end of the episode, when he is out of the hospital. Sam also wears the coat inside his dreams. In Devil May Care (9x02), Sam is still wearing the coat at the beginning of the episode, but changes after Dean shows him that Crowley is in the trunk and before they arrive back at the Bunker. In Holy Terror (9x09), Sam wears this coat whenever he (or his body) is outside in the episode (except when he’s wearing a suit during the investigation at the biker bar and while having beers with Castiel). He (or, rather, Gadreel) is still wearing it, after having just returned to the bunker, when Dean confronts him at the end of the episode and Gadreel kills Kevin. In Road Trip (9x10), Sam’s body wears this coat throughout the whole episode. 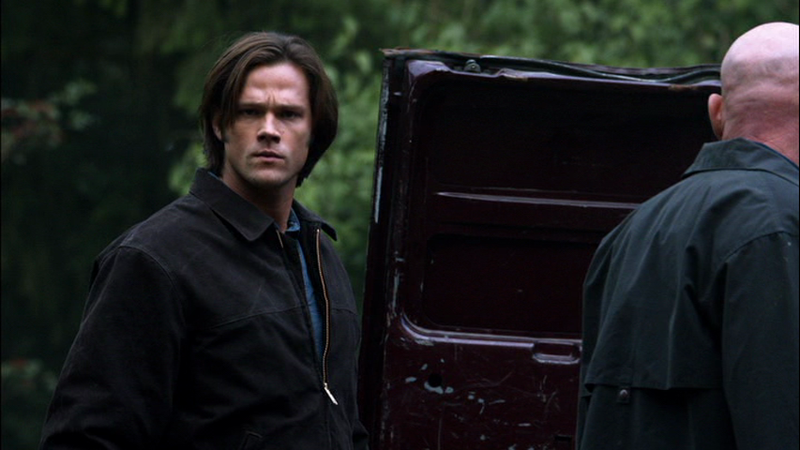 When Crowley enters Sam’s mind to find him, however, Sam is not wearing the coat inside his own head. In Captives (9x14), Sam wears this coat when he and Dean go to try to talk to Candy’s ghost in Wichita and at the end of the episode they bring Mrs. Tran back to the Bunker. In Alex Annie Alexis Ann (9x19), Sam wears this coat at the end of the episode when he and Dean say goodbye to Jody. In Girls, Girls, Girls (10x07), Sam wears this coat once he and Dean leave the steak-house after the first scene. Only taking it off briefly to wear a suit in order to ask questions at the restaurant that Rowena visited. In Hibbing 911 (10x08), Sam wears this coat after Donna learns about vampires and he and Dean can drop the FBI facade. He wears it until the end of the episode. In About a Boy (10x12), Sam wears this coat from when he puts it on while he leaves the motel room to accompany Dean back to the witch’s house until the end of the episode. In Book of the Damned (10x18), Sam wears this coat whenever he is outside the bunker. He also takes it off in the cabin where Charlie is staying once they get down to serious researching. In The Werther Project (10x19), Sam wears this coat at the beginning of the episode when he is speaking with Rowena and then goes to Tulsa to meet up with Dean. He takes it off once they get back to the Bunker and then doesn’t wear it again. In Our Little World (11x05), Sam wears this coat when he and Dean go to the abandoned asylum in the hopes of killing Amara. In Beyond the Mat (11x15), Sam wears this coat to the wrestling match after the funeral, and keeps it on for the rest of the episode. In LOTUS (12x08), Sam wears this jacket when they leave the Bunker to go try to defeat Lucifer. He wears it for the rest of the episode. In First Blood (12x09), Sam is still wearing this jacket when he and Dean are arrested and taken to the top-secret prison base. They are then given jumpsuits to wear. 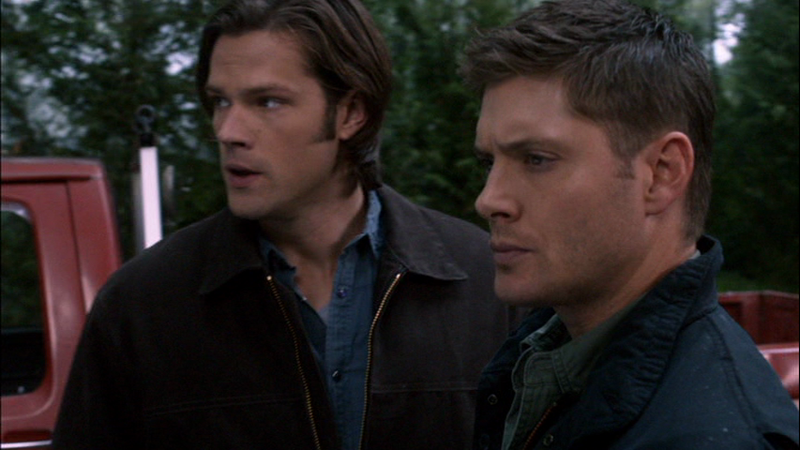 FATE: When Sam and Dean are arrested in First Blood (12x09), their clothing is confiscated. When they escape, they escape only in their prison jumpsuits and do not recover their clothing.